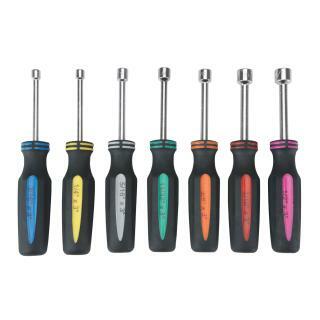 "Nut driver, Hollow Shaft, US Customary, 7 pc set" has been added to your cart. 7 piece SAE/US Customary Nut Driver tool set contains the most common sizes needed for pinball playfield and cabinet work. Nearly all pinball machines use SAE (Society of American Engineers) sized hardware. The hollow shaft in these nutdrivers allows you to remove nuts from protruding bolts with ease. They are constructed of machined and chrome-plated high carbon steel shafts for durability. Each handle is color coded by size for easy selection and features a comfortable nonslip grip. These quality tools are great for pinball technicians and hobbyists.